1) This paper has been presented as a keynote presentation at the XXIV FIG Congress in Sydney 11-16 April 2010 in plenary session on spatially enabled society. Dr. Rajabifard is the President of the Global Spatial Data Infrastructure (GSDI) Association. He is Associate Professor and Director of the Centre for Spatial Data Infrastructures and Land Administration at the Department of Geomatics, the University of Melbourne. At the FIG Congress in Sydney FIG and GSDI signed a memorandum of understanding. Handouts of this presentation as a .pdf file. Spatially Enabled Society is a scenario when the society manages their information “spatially” using spatial component. This can be a response to our increasingly complex and rapidly changing world. In this environment, meeting sustainable development objectives and responding to Millennium Development Goals (MDGs) are also complex and temporal processes which involving multiple stakeholders. The creation of economic wealth, social stability and environmental protection in line with MDGs can be achieved through the development of products and services based on spatial information collected by all levels of government. These goals and objectives can be facilitated through the development of a spatially enabled government and society, where location and spatial information are regarded as common goods made available to citizens and businesses to encourage creativity and product development. This requires data and services to be accessible and accurate, well-maintained and sufficiently reliable for use by the majority of society which is not spatially aware. Spatial Data Infrastructures (SDIs) as enabling platforms are being developed by many countries to improve access, sharing and integration of spatial data and services however, there are still many issues and challenges which need to be overcome in order to have a fully functioning platform. This paper aims to discuss the concepts and current trends globally in spatially enabled government and society and then discuss various challenges and issues associated in re-engineering current SDI design as an enabling platform to support the new vision on spatially enabled government and society. The paper highlights a range of activities and processes to be created across all jurisdictional levels in order to facilitate such a platform design and development. This includes aspects of designing, creating and processes involved in development and in particular governance of an SDI platform. Ready and timely access to spatial information - knowing where people and assets are - is essential and is a critical tool for making any informed decisions on key economic, environmental and social issues. Spatial information is an enabling technology/infrastructure for modern society. Our relationships with our physical world and the way we use our social networks are changing as we deploy technology in new ways to create new ways of interacting with each other. Spatial information and technologies are key tools in this transformation because we define our relationships by place. The ‘spatial enablement’ that these tools create can reshape our lives as highlighted in VSIS (2008). In facilitating this and to improve access, sharing and integration of spatial data and services, SDIs have emerged as enabling platform. SDI is a dynamic, hierarchic and multi-disciplinary concept that includes people, data, access networks, institutional policy, technical standards and human resource dimensions. SDIs were initially developed as a mechanism to facilitate access and sharing of spatial data for use within a GIS environment. However, the role that SDI initiatives are playing within society is now changing. Users now require the ability to gain access to precise spatial information in real time about real world objects, in order to support more effective cross-jurisdictional and inter-agency decision making in priority areas such as emergency management, disaster relief, natural resource management and water rights and in meeting sustainable development objectives and responding to Millennium Development Goals which are complex and involved temporal processes with multiple stakeholders. Having said that, the ability to gain access to information and services has moved well beyond the domain of single organizations, and SDIs now require an enabling platform to support multi-sourced data integration and the chaining of services across participating organizations and countries. The ability to generate solutions to cross-jurisdictional issues has become a national priority for many countries for the development of effective decision-making tools which is a major area of business for the spatial information industry. Much of the technology needed to create these solutions already exists; however, it also depends on an institutional and cultural willingness to share outside of ones immediate work group. This creates the need for jurisdictional governance and inter-agency collaborative arrangements to bring together both information and users to facilitate the realization of spatially enabled society. This paper discusses the concepts of spatial enablement and various challenges and issues associated in re-engineering current SDI design to facilitate SDI development, monitoring and their assessments. The paper outlines the role of SDI in creating more effective decision-making processes to deal with cross-jurisdictional issues through the creation of an enabling platform that links services and information across jurisdictions and organizations. This is to support the new vision on spatially enabled government and society. This would support a knowledge base to access information derived from a model of integrated datasets from different perspectives. The creation of economic wealth, social stability and environmental protection can be achieved through the development of products and services based on spatial information collected by all levels of government. These objectives can be facilitated through the development of a spatially enabled government and society, where location and spatial information are regarded as common goods made available to citizens and businesses to encourage creativity and product development. This requires data and services to be accessible and accurate, well-maintained and sufficiently reliable for use by the majority of society which is not spatially aware. In this regard, in modern society, spatial information is an enabling technology or an infrastructure to facilitate decision making. Spatial information can be a unifying medium in which linking solutions to location. According to Victorian Spatial Information Strategy (VSIS 2008), user demand has shifted to seeking improved services and delivery tools. This will be achieved by creating an environment so that we can locate, connect and deliver as illustrated in Figure 1. Figure 1. Locate, connect and deliver spatial information. With this in mind and in order to better manage and utilise spatial data assets, many countries around the world are developing SDI as a way to facilitate data management and data sharing and utilise their spatial data assets as this information is one of the most critical elements underpinning decision making for many disciplines. The steps to develop an SDI model vary, depending on a country’s background and needs. However, it is important that countries develop and follow a roadmap for SDI implementation. SDI as an enabling platform is an integrated, multi-levelled hierarchy of interconnected SDIs based on partnerships at corporate, local, state/provincial, national, multi-national (regional) and global levels. This enables users to save resources, time and effort when trying to acquire new datasets by avoiding duplication of expenses associated with the generation and maintenance of data and their integration with other datasets. However, SDI is an evolving concept and can be viewed as an enabling platform linking data producers, providers and value adders to data users. With this in mind, many nations and jurisdictions are investing in developing such platforms and infrastructures that enable their stakeholders to work together in a more mutual approach and to create distributed virtual systems that support better decision-making. At the same time, these nations and jurisdictions need a system to assess and monitor the development and performance of the platform. The development of an SDI as an enabling platform for a country will enhance the capability of government, the private sector and the general community in engaging in systems based, integrated and holistic decision making about the future of that jurisdiction and this could help the country capacity to respond to MDGs and meeting sustainable development objectives. Applications, tools, and different sorts of information required to achieve these objectives would be available through the platform to build a view of, query and allow decisions to be based on, both the built and natural environments which further could help in responding to MDGs. Having said that, however, there is a need to move beyond a simple understanding of SDI, and to create a common rail gauge to support initiatives aimed at solving cross-jurisdictional and national issues. This SDI will be the main gateway through which to discover, access and communicate spatially enabled data and information about the country and regions. Such an entity can be enhanced so that it is possible to share in addition to data, business goals, strategies, processes, operations and value-added products. SDIs aim to facilitate and coordinate the sharing of spatial data between stakeholders, based on a dynamic and multi-hierarchical concept that encompasses the policies, organizational remits, data, technologies, standards, delivery mechanisms and financial and human resources necessary to ensure that those working at the appropriate (global, regional, national, local) scale are not impeded in meeting their objectives (GSDI, 1997). This in turn supports decision making at different scales for multiple purposes, and enables users to save both time and money in accessing and acquiring new datasets by avoiding duplication of expenses and effort associated with the generation and maintenance of spatial data (Rajabifard et al. 2006a). However, effective use of spatial information requires the optimization of SDIs to support spatial information system design and applications, and subsequent business uses. The need to find optimal SDI models requires ongoing research that reflects current social, cultural and business systems, as the measured benefits of building SDIs have not been as forthcoming as projected. To achieve this, the concept of an SDI is moving to a new business model, in which the SDI promotes partnerships of spatial information organizations (public/private), allowing access to a wider scope of data and services, of greater size and complexity than they could individually provide. SDI as an enabling platform can be viewed as an infrastructure linking people to data (Rajabifard et al., 2006b) through linking data users and providers on the basis of the common goal of data sharing (Figure 2). In this environment all types of organizations participating (including governments, industries, and academic) can gain access to a wider share of the information market. This is a vision to facilitate the integration of existing government spatial data initiatives for access and delivery of data/information to a wider society and also at a multi-national level collaboration. This integration would be based on common standards and business understanding and combines distributed functions provided by participating organizations to deliver services which structured and managed in such a way that to be seen by third parties as a single enterprise. The creation of an enabling platform would lower barriers to access and use of spatial data, to both government and the wider community within any jurisdiction, and particularly to the spatial information industry. If barriers are minimised, then entities would be able to pursue their core business objectives with greater efficiency and effectiveness. In particular, industry would be able to reduce their costs, which would encourage investment in capacity for generating and delivering a wider range of spatial information products and services to a wider market. 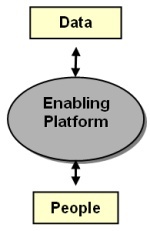 Having said that, in order to develop a successful and functioning platform requires a set of concepts and principles to enable the design of an integration platform that facilitates interoperability and inter-working of functional entities within a heterogeneous environment. Further, these concepts and principles can be used as indicators to assess the performance of SDIs. Spatially Enabled Society is a scenario for the future as we are in an increasingly complex and rapidly changing world. Societies can be regarded as spatially enabled ‘where location and spatial information are regarded as common goods made available to citizens and businesses to encourage creativity and product development’ (Wallace et al. 2006). In this regard, the vast majority of the public are users, either knowingly or unknowingly, of spatial information. With these considerations in mind, the challenges that must be overcome to make existing SDIs more appropriate for spatially enabling government and society (Masser et al. 2007). Based on this view, there are four strategic challenges arising (Figure 3). The first of these is the need for more inclusive models of governance given that SDI formulation and implementation involves a very large number of stakeholders from all levels of government as well as the private sector and academia. The second concerns the promotion of data sharing between different kinds of organization. In some cases this may require new forms of organization to carry out these tasks. The third challenge relates to the establishment of enabling platforms to facilitate access to spatial data and the delivery of data related services. The fourth challenge arises from the changes that are taking place in the nature of the users of spatial information in recent years. In place of the spatial professionals who have pioneered these developments an increasing number of end users will need some training in spatial thinking to make them more literate users. Consequently there are a number of new capacity building tasks to be undertaken in order to create a fully spatially enabled government. The maintenance of environmental sustainability through the regular and repeated monitoring of a wide range of spatial indicators distributed throughout the country as a whole. Realizing this vision of spatially enabled society is dependent on the development of appropriate mechanisms to facilitate the delivery of data and services. These mechanisms should embody the following principles that are the foundation of the INSPIRE initiative (CEC 2004). Identify what spatial data is available, its fitness for purpose and conditions on its use, through effective sorting and data mining. Organise government business processes around “place” information by geocoding of places and features. In order to facilitate the realization of spatially enabled society and governments, there is a need for a service-oriented infrastructure on which citizens and organizations can rely for the provision of required services, going beyond what has been described as the first and second generation of SDI development of a data discovery and retrieval nature (Rajabifard et al. 2003). This includes a focus for spatial information managers on the delivery of a virtual world which facilitates decision making at a community level within a national context. There is also the need to develop institutional practices to make existing and future technology more effective. Research has found that very few jurisdictions have developed a framework for establishing a spatial infrastructure that addresses comprehensively operational, organizational and legal issues. It is these processes that will enable the infrastructure to be readily useable and available to all stakeholders. This translates into the future focus for spatial information managers on the delivery of a virtual world which facilitates decision making at a community level within a national context. This requires integration of the natural and built environmental data sets and the need for a spatial data infrastructure that facilitates this integration. The technology exists to create this virtual world but this is not enough in itself without the sustained input from both data producers and users. The benefits of a virtual world will include the representation of feature-based structures of the world as well as the administration and institutional aspects of such features, enabling both technical and institutional (eg. policies) aspects to be incorporated into decision-making. It is this aspect of research that is often identified as more challenging than complex technical issues. The vision of a virtual world however is overly simplistic and presents many challenges, with one of the major challenges being the creation of an SDI to support the vision. Whilst most SDI authorities will agree that SDIs should be user driven, there is little discussion on the spatial information vision for each country or what sort of ICT enabled society we wish to be. However unless an agreement on a spatial information vision for each country (or jurisdiction) is made, it is almost impossible to create an appropriate SDI vision. Therefore the first challenge is to clearly describe and articulate the type of society an SDI should support. Some other challenging questions for future SDI development are posed by the need for a high level of multilevel stakeholder participation in SDI implementation. Further, the development of SDI initiatives driven more by sub-national governments differ from the top-down approach that is implied by the development of national led SDIs, implicit in much of the current SDI literature. This new bottom-up sub-national view is important as it highlights the importance of diversity and heterogeneity given the different aspirations of various stakeholders. Consequently, the challenge to those involved in SDI development is to find ways of ensuring some measure of standardization and uniformity while recognising the diversity and heterogeneity of various stakeholders. The use of open standards and an interoperable enabling platform will allow functions and services that meet business needs to be brought together at a sub-national and application level, reducing duplication of effort and furthering the development of a spatially enabled society. growth in capacity at societal, institutional and individual levels. The GSDI Association is a non-profit, inclusive, global organization made up of members from different countries both from emerging and developed nations, major industry and government organizations, and individuals. The organization promotes international cooperation and collaboration in creating local, national and international SDI to assist nations to address social, economic, and environmental issues. The Association promotes the Global SDI to facilitate ready, world wide access to geographic and spatial information to support decision making at all scales for multiple purposes. The Association plays a critical role in helping to address societal problems through the use of spatial capacity. GSDI Association has come along way since the GSDI initiative began in 1996 and the Association came into existence in 2002. However, the scope of the Association has broadened considerably in this relatively short time. This reflects the expanding uses to which spatial capacity is now able to be deployed, the increasing diversity of organizations and skills now using this capacity, and the corresponding expansion in demands of Association members. The essence of what the Association does is help to create an enabling environment that enhances outcomes in societies, economies and the global environment. The betterment of societies through spatial enablement is one of the goals of this association. Spatial enablement will assist both developed and developing countries to pursue sustainable development objectives and MDGs and it will ensure better productivity and efficiency. Therefore, GSDI Association considered “Realizing Spatially Enabled Societies” as a theme for the Association in the next period and the GSDI-12 world conference in Singapore in October 2010. Responding to millennium development goals and meeting sustainable development objectives we need to develop can be achieved through the development of products and services based on spatial information collected by all levels of governments and these objectives can be facilitated through the development of a spatially enabled government and society. The development of a spatially enabled government and society is ongoing and multi-disciplinary; achieving it will draw on a wide range of experiences and disciplines from surveying and mapping, land administration, GIS, information and communications technology, computer science, legal and public administration and many more. This paper has addressed four strategic challenges that need to be considered when implementing SDIs to spatially enable society. The first of these indicates the need for new and more inclusive models of governance to enable the very large number of stakeholders from all levels of government as well as the private sector and academia to participate in the management of the processes of SDI implementation. The second challenge considered the strategic questions associated with data sharing between different kinds of organization. The third challenge relates to the establishment of enabling platforms to facilitate access to spatial data and the delivery of data related services. It can be viewed as an infrastructure linking people to data through linking data users and providers on the basis of the common goal of data sharing. Further, this infrastructure would be a vehicle from which both textual and spatial data are utilized to form a range of supported functions for those within the industry as well as non-spatial and non-technical user groups. The fourth challenge related to the capacity building issue which tasks to be undertaken in order to create a fully spatially enabled society. Further, the ability to implement spatial enablement, requires a range of activities and processes to be created across all jurisdictional levels. Commission of the European Communities, (CEC), (2004), Proposal for a Directive of the European Parliament and the Council establishing an infrastructure for spatial information in the Community (INSPIRE), COM (2004) 516 final, Brussels: Commission of the European Communities. Masser, I. (2005), GIS worlds: creating spatial data infrastructures, Redlands CA ESRI Press. Masser, I., Rajabifard, A., and Williamson, I.P. 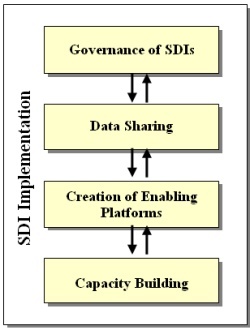 (2007), ‘Spatially Enabling Governments through SDI implementation’, International Journal of GIS, Vol. 21, July, 1-16. Rajabifard, A. (Eds), 2007, ‘Towards a Spatially Enabled Society’ ISBN 978-0-7325-1620-8, The University of Melbourne. 400 pp. Rajabifard, A., Binns, A., Masser, I., and Williamson, I.P. (2006a), ‘The Role of Sub-national Government and the Private Sector in Future SDIs’, Vol 20, No 7, International Journal of GIS, 727-741. Rajabifard, A., Binns, A. and Williamson, I. (2006b), Virtual Australia – an enabling platform to improve opportunities in the spatial information industry, Journal of Spatial Science Special Edition, Vol. 51, No. 1, June 2006. Rajabifard, A, Feeney, M.E.F., Williamson, I.P., and Masser, I., (2003), ‘National SDI Initiatives ’, Chapter6, Development of Spatial Data Infrastructures: from Concept to Reality, ISBN 0-415-30265-X, Taylor & Francis, U.K.
Wallace, J., Rajabifard, A., and Williamson, I. (2006), Spatial information opportunities for Government, Journal of Spatial Science, Vol. 51, No. 1, June 2006. Dr. Abbas Rajabifard is an Associate Professor and Director of the Centre for SDIs and Land Administration at the Department of Geomatics, the University of Melbourne. He is President of the GSDI Association, was Vice Chair of Working Group 3 of the United Nations supported Permanent Committee on GIS Infrastructure for Asia and the Pacific (PCGIAP), and is a member of ICA-Spatial Data Standard Commission, and a member of Victorian Spatial Council.